Australian leaders have tended to make most of their key foreign policy speeches abroad, a point I gently made in The Interpreter earlier this year. Foreign Minister Julie Bishop responded to this criticism in the most direct way possible, by making her first major address after the Foreign Policy White Paper’s publication at my own La Trobe University. The speech and discussion that followed highlighted key themes of the White Paper: an optimism about the future; a recognition of the risks entailed by the way economic prosperity is changing the region’s status quo; and, of course, an active embrace of the Indo-Pacific construct as the country’s principal strategic point of reference. But beyond ensuring those key messages were sent, there was also a bit of colour and movement. Bishop opened by reflecting on how history might look back at the current era and judge us by the extent to which we did or did not stand up to defend the liberal order. Indeed, at the very end of her time on stage, Bishop said very directly that we had to be prepared to fight to defend liberal ideas, as the alternative would be catastrophic. The concept of Julie Bishop as liberalism’s avatar sits a little uneasily with her professional and pragmatic persona, yet she seemed most animated when discussing ideas that are clearly under threat in the region and indeed globally. The rules-based order was, predictably enough, held out as key to the success of the region and Australia’s unbroken 27-year run of economic growth, but among those fingered for breaking the rules there was a notable absentee. Russia and North Korea were repeatedly namechecked as countries breaking the rules. But the country that was the subject of Australian Government ire on this matter in 2017 was not mentioned in such a fashion. China was nodded to as a beneficiary of the order, yet was conspicuously separated from world politics’ current pantomime villains. This is in line with what looks to be a decision by the government to walk back its more heated criticism of China and attempt to better align its rhetoric with its policy. The Trump administration received a gentle chiding for its trade policy. Bishop emphasised that Australia has repeatedly pointed out at the highest levels in Washington the benefits of a liberal approach to trade and the dangers of protectionism. On this, there is plainly some daylight between the allies. Bishop did not buy the claim put forward by some Trump supporters that his bellicose tone had “won” the liberalisation moves flagged in Xi’s Boao Forum speech. Bishop rightly pointed out that this was a continuation of policies Xi flagged last year and at the National Party Congress, and that supercharged language about a trade war was not helpful to anyone. 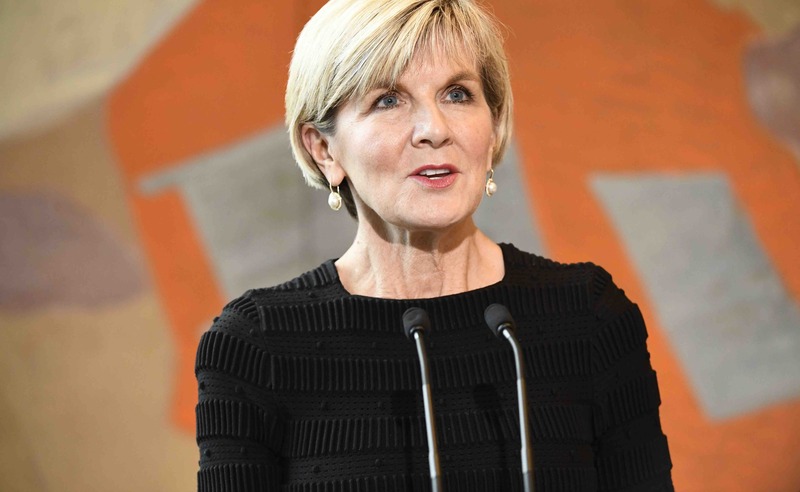 Finally, Bishop underlined the importance of people-to-people connections and displayed a genuine sense of pride in the achievements of the New Colombo Plan, emphasising her commitment to continue to broaden and deepen the program. This was in contrast to the recitation of various other features of Australian policy, such as the number of missions abroad and institutional commitment, in which one felt the heart and mind were not quite as one. The New Colombo Plan is a great initiative of which the minister is justifiably proud. The speech began and ended with an evocation of history and the sense that Australian foreign policy is grappling with the most difficult contest of all – one of ideas. Notwithstanding Bishop’s efforts, one was left with the sense that there remains a big gap between Australia’s defence of liberalism in speeches and policy statements and its actual policy. But at least we are talking about this stuff on home soil.